Do land ETB effects go on the stack from a Warp World? , : Thespian's Stage becomes a copy of target land and gains this ability. There's a couple others you should consider. Ash Barrens = Cycles for any color of mana which you can play untapped. Path of Ancestry = Literally a Command Tower that comes in tapped. It's strictly better than a tri-land if your commander has 3 or more colors. Mirrodin's Core = Comes in untapped. Can give you any color of mana the very next turn. 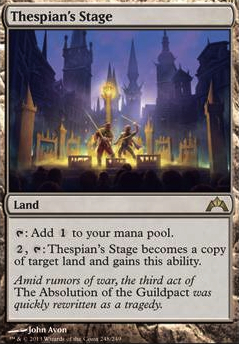 Thespian's Stage = Copy target player's Command Tower . Hey! Great build, just wanted to make two suggestions. I run Muldrotha lands (although it is more geared toward good stuff) and one of my win-cons is Torment of Hailfire , like yours. I would -highly- recommend Cabal Coffers and Urborg, Tomb of Yawgmoth combo, alongside Vesuva and (a card you're already running) Thespian's Stage . A couple cards that help enable it and work to find Dark Depths : Pir's Whim and Hour of Promise . Once you have 20+ mana, recurring Emrakul, the Promised End or Mindslaver each turn can be a fun back-up plan. Check my list for more cool ideas! While garagadon doesn't interact with hex parasite like that, it does like having a lot of bodies to sac, and interactions with persist and undying make Geralf's Messenger or Kitchen Finks combos a little smoother, providing an alternative 1 mana outlet to the usual Viscera Seer . For cards that do interact with parasite, the most notable Dark Depths has been banned a long time ago due to Vampire Hexmage and Thespian's Stage making it too strong. Lost Auramancers , Quicksilver Fountain , Thing in the Ice Flip and the ahmonket 'drop -1-1 counters on your creatures' cards are all interesting options. Zubera tribal similarly has some pretty amazing lists built around Return to the Ranks and similar 'mass res' spells. Vaevictus seems bad IMO. Vorinclex also seems like a bad fit for the deck. 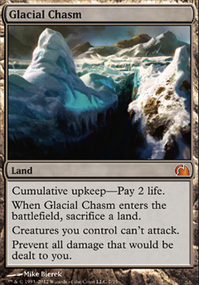 Id definitely run a bigger package of scapeshift crap like Thawing Glaciers , Stone-Seeder Hierophant , Thespian's Stage , Scapeshift , Amulet of Vigor , etc. Can confirm its better than the reanimate package and other big beasties. Yo, I would recommend Corpse Dance . Works well with ur sac outlets. 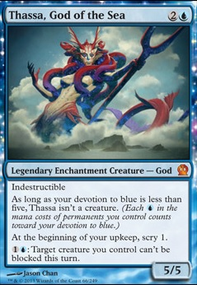 Alternative to your commander incase tax is too much/locked out. Honestly whenver I see a black player, I always try to lock them out with enchantments and artifacts assuming they are the threat. It's instant speed and RL. Moreover, very few people expect it. To take out, I would take out the witch the guy above suggested. You don't really need grave hate unless GY shen are prevalent in meta. Even then, ur commander should be ur grave hate. Unless you really feel you need the redundancy, I feel this redundancy would be better. Up to you. Moreover, ever thought of Thespian's Stage or Vesuva ? 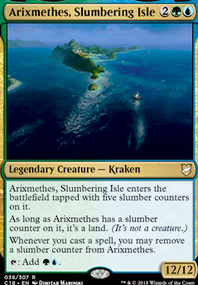 They are slower but can be coffer copies or just useful utility if you can flex your mana base. Usually mono black decks can due to urborg, but ur list is more competitive so maybe not? ah nvm i thought Thespian's Stage only lasted until end of turn. Thespian's Stage copying Swarmyard is pointless. they are both tap abilities, meaning you won't be able to copy and regenerate in the same turn.